Teaching would be easy if there were clear recipes you could follow every time. The Ingredients for Great Teaching explains why this is impossible and why a one-size-fits-all approach doesn’t work. Instead of recipes, this book examines the basic ingredients of teaching and learning so you can use them wisely in your own classroom in order to become a better and more effective teacher. 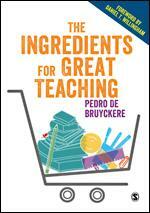 Taking an approach that is both evidence-based and practical, author Pedro de Bruyckere explores ten crucial aspects of teaching, the research behind them and why they work like they do, combined with everyday classroom examples describing both good and bad practice. This is essential reading for teachers everywhere.